American Motorcycle Trading Company is proud to announce that we have partnered with Taz’s Professional Detail Service to make our used motorcycles look like new. Jerome Nowlin (Taz) is the owner of Taz’s Detail, and he has over 22 years of experience in the business. He not only knows the tricks of the trade, but Taz is a biker as well. He currently rides a 2011 custom Harley-Davidson Road Glide, and he knows how we feel about our motorcycles. 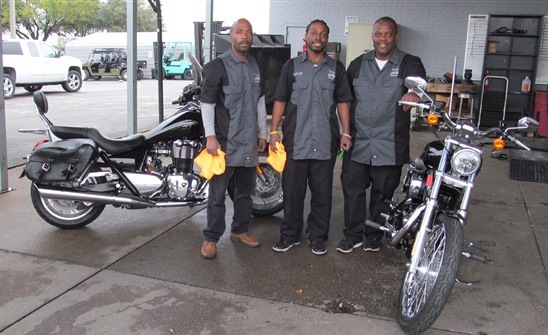 Taz and his crew (Curt & Angelo) will be at AMTC Tuesday thru Saturday from 9-6, to serve you with any of your detail needs – motorcycles, autos, boats, etc . 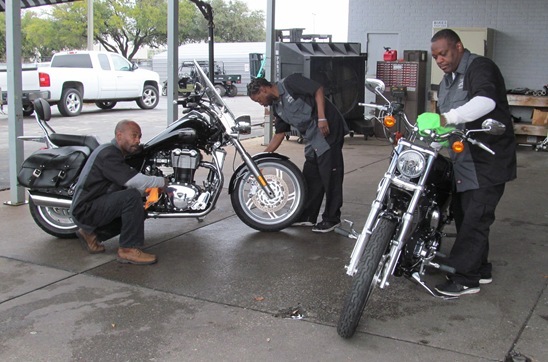 . . Not only will they give your bike a thorough washing from the tires to the hand-grips, but one of their specialties is buffing unwanted scratches out of your paint. They finish off the detail with a shiney wax job and sparkling chrome. Left to Right: Angelo, Curt and Taz. Come by and give ‘em try, or call Taz here at AMTC, 817-695-1151 to schedule an appointment. Click Here to visit Taz’s Facebook page. Next post: Now THAT is a Sidecar!